When a longstanding artistic trope undergoes sudden mutations, the shift can feel tectonic. This is what has happened to the genre of self-portraiture since the advent of the “selfie,” a phenomenon taken up in recent months by arts writers Jerry Saltz and Alicia Eler. The group show "Self(ie) Portraits" addresses changes in self-portraiture across traditional and new media as filtered through the perspectives of seven artists, six of them Americans, one British. Of these, TJ Norris takes the most straightforward pictures, photographing himself in reflective surfaces such as windows, car mirrors, and glossy signs. His images, self-aware but not particularly artful or flattering, stress the pornographically frank solipsism inherent in the act of taking one’s own picture just because one can. On the other end of the artifice spectrum is Jordan Rathus’ "REAL WORK/THE GAME SHOW," which depicts the artist in a dramatically framed closeup, made up like a Golden-Age Hollywood starlet with bright lipstick, dusky mascara, and a brassy blond wig. A bespectacled man peers over her shoulder, heightening the piece’s air of exhibitionistic self-parody. In another work by Rathus, "Step n’ Repeats 1-9," she has created a cardboard cutout of herself and invited tourists to pose beside it. The resulting images become self-portraits of a self-portrait, wryly critiquing the conceit of the contemporary artist as multimedia celebrity. Along these lines, artist Julie Perini takes a uniquely maddening conceptual tack in her ongoing series of videos and digital prints, collectively entitled "Flattened video: They have a name for girls like me." Perini chooses films with characters who have the same first name as she does. Then she edits the films down such that the only moments that remain are those in which the character’s name is spoken. This yields a prolonged, oddly affecting stutter — “Julie … Julie … Julie … Julie ...” in different contexts, divorced from any semblance of plot — rather like a Philip Glass aria. 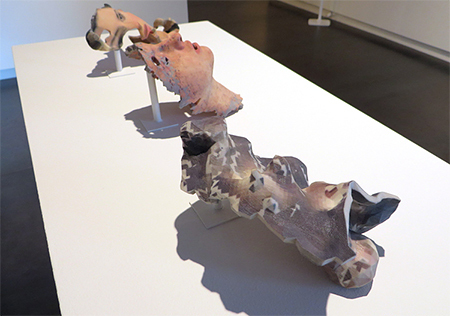 Even more unsettling than Perini’s iterations are artist Lorna Barnshaw’s "Replicants." These 3D-printed plastic resin sculptures recall the bared electronic innards of Yul Brynner’s robotic gunslinger in Westworld. Transmogrifying smartphone selfies and ambient digital imagery, Barnshaw has superimposed facial features on face-like shapes. With their realistic contours, unrealistic scale, and irregular edges, they look like masks or slices of flayed face awaiting transplant. Mounted on small pedestals, the sculptures have a fetishized presence that is freakish and uncanny. Samuel Morse’s immortal exclamation, “What hath God wrought!” comes to mind. Samantha Wall’s old-fashioned drawings on paper provide welcome relief after Perini’s and Barnshaw’s new-media surfeit. In her "Square the Circle," Wall presents herself kneeling on the ground, encircled by red powdered pigment. She is blowing the pigment as prehistoric cave painters once blew pigment to create reverse-image handprints. Seven shadowy figures surround Wall’s image, crouching, lying, standing, observing. Who are these shadows: the cave painters to whom the piece alludes; echoes of the artist’s former or future selves? Wisely — blessedly — Wall leaves these ruminations to the viewer. Her restraint implicitly rebukes those of us who fervently and oh-so-blandly record our every meal and social interaction for posterity (or for posteriority, in the case of buttocks-baring selfie queen Kim Kardashian). Wall retains a view of a self that respects its own mystery, retracts from our attempts to plumb it, and woud sooner shrink than spread itself ever-more-widely to the eyes of inferred multitudes.